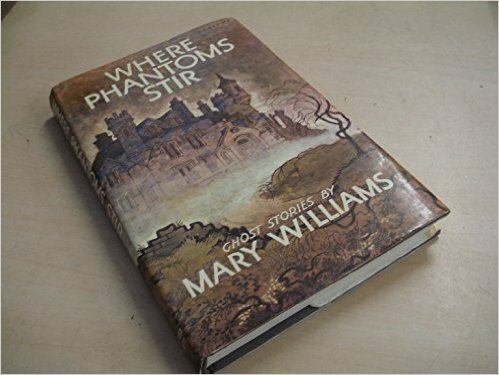 Mary Williams was a superb ghost writer who after establishing a sucessful career as a romance writer turned to short stories dealing with the supernatural. Born in Wales she moved to Cornwall where she spent most of her life and became deeply attached to the uniqueness of the ancient land she soon developed a passion for Cornish Legends and Folklore which provide inspiration for many of her short stories which are almost all set in Conrwall. Mary Williams went on to write 17 volumes of short story collections, Chill Company, The Dark Land, Ravenscarne and other stories, Time after time and other stories, They Walk at Twilight, Haunted Waters, Unseen Footsteps, Whisper in the Night, Where Phantoms Stir, Ghostly Carnival, Where no Birds Sing, Creeping Fingers and Other Stories of the Occult, Haunted Garden, The Haunted Valley, Trembling Shadows and other stories of the Occult, Creeping Fingers, The Dark God and The Secret Pool. Mary Williams remains just as mysterious as her tales. She passed away at the grand age of 97 in 2000 and wrote up til her death. The stories of Mary Williams are dark but genteel with a perfect mix of charm, dark undertones and a brooding intense atmosphere. These tales are not what you would call horror there is something I find comforting in these tales. They talk of a time long since passed which serves to heighten their haunting effect and the characters are quirky with oodles of English eccentricity. Where Phantoms Stir was originally publsihed in 1976 and contains 16 ghostly and macabre tales, my favourites ones are; Widgett's End, The Legend, The Bad Land and Poor Kate. "Before she opened the bedroom curtains Olivia Crane knew she would be there...watching from the quietness...waiting for..."
Olivia Crane has lead a life free from passion and love and has instead focused her life to her career as a trained psychologist and doctor of philosphy and she feels much better for it. She has no time for silly tribulations and whilst writing her book she comes to Penderclose, a cornish cottage to finish it in some much needed peace and quiet. However during her stay she is hanuted by a living girl, Lucy Brent who lost her heart in Penderclose but she get's no pity from Oliva Crane who declares herself above all the nonsense of falling in love and giving in to passion. But the heart is a hunger hunter and no matter how hard she tries to lead to celibate life she can't help but fall for a man quite out of her reach. "Still...in the hushed silences and golden, almost windless mornings and evenings of that far off summer, I did, at times, feel a trespasser, or rather visitant, in another sphere...another dimension of existence." Julian's father and stepmother become worried for their child Julian who does not seem to be like the other children his age and has spent much of his life in isolation. Inevitably his loneliness is filled by a companion named Jo albeit one that has been born in Julian's imagination. Desperate to have Julian intergrated into society his parents call on Elizabeth's brother Bill to come and visit them at Carnwood and give his professional opinion as a schoolmaster. What he finds is an intelligent young boy saying one last good bye to his childhood innocence. "Even now, after five years, the very thought of Joseph gives me a bit of a jolt when I remember. So I try to put him out of my mind when I can. It's not easy though. It was all so very macabre; the last thing I'd have expected." Ameila had spent her whole life in captivity by her overbearing and ailing mother but when she meets Joseph Biddle at the circle her fortunes change. He too has spent his life caring for his mother forfeiting his only chance of marriage and a family of his own and they both shae in interest for the occult and music. Amelia longs for the passion she never had in her youth whilst Joseph longs for something more sinister. "At first glance I liked the house and thought...'this is the place.' So did Jenny. In fact she was all aglow with enthusiasm." Geoff and Jenny with high hopes for their futures move to the idyllic Cornish countryside after purchasing their dream home; Mournevale. It is this perfect home, a retreat from the harshness of city life, that fuels their burning desire to have and raise a family of their own in this quaint little eden. It all seems so perfect but does perfection ever exist? "When William and Martha Pollet moved south from the midlands, it was as Martha put it...'Not to retire; but to start a new life of fresh horizons and interests which would add colourful dimensions to the autumn of their days." A humourous tale of a married couple retiring to Cornwall to start their autumn years. Neither William and Martha are as happy as they seems and whilst Martha throughs herself into village life William discovers an unsual new art hobby. "At first her face was merely a disc of white in the thickening waves of curling mist; then as the light cleared momentarily, he saw the figure of a girl approaching hesitantly from the side of the lane." Charles Baines after the breakdown in his marriage takes himself to Cornwall on a walking holiday to explore the wilds of the ancient land. Except he gets a little bit more than he bargained for when he bumps into a beuatiful stranger one evening whilst lost in a shrouding mist upon the moors. "That's why I'd been thinking about Sally. Sally in the past, had helped me through so much, during the immediate post-war years, when she and her husband Mich had lived on the barge." Whilst struggling to come o terms with her husbands plight Ellie thinks back to better times where she had stayed with her close friends , Sally and Mick, on their barge as she recovered from a disastrous relationship. She hasn't seen Sally in a long time but she's in dire need of that very rare thing; a good friend. "She glanced up and said cooly with the habitual contempt reserved for me, 'Oh go away Fred. You bore me.' "
Lucinda and her husband are trapped in a loveless marriage. Now there love is gone there is nothing left and they're both hiding macabre secrets which each one wants to remain hidden. "My first impression was of intense cold. As I pushed the door open and went inside a wave of dank icy air blew unwelcomingly from the dark recesses of the house, whirling from a spiralling flight of stairs, which I saw from the wan light of my torch, were of stone and uncarpeted." "In other words, she could be, when she chose, any number of things to any number of people." " 'The point is...' Noel Chadwick said with his keen eyes reflectively on the young couple...'There is bad land as well as good. And I'm not referring to farming...' his lips twisted into a brief smile that lit his lean dark countenance to sudden lively whimsicality." Newly weds Fiona and John have come to Cornwall for thier picturesque hoeymoon at the golden dragon where they meet Noel Chadwick who is working on a book examining all the unexplained dissapearances that have occurred in Cornwall in the past decade. With the fat white clouds and the birds flying by..."
Mary Elizabeth an eight year old girl comes across a little ghost child in the back of her garden but this girl is not an ordinary child she's not afraid of it or any of the other ghosts from the great grey ghost house. So she carries on playing in the swing singing her favourite song without a care in the world. "It was not so much his dress, however, that attracted my attention in a place renowned for it's colourful eccentrics and assembly of beautiful and non-beautiful people...but the fact that he had a green and scarlet parrot perched on one shoulder, a ginger kitten in his arm, and the face of a minature Chawawa poking out of his pocket." A painter rents a cottage Port Catlyn, Cornwall to o a spot of painting where he becomes transfixed by a local colourful character that seems to change as often as the tide. One minute he's strolling through town with his animal companions the next he's dressed in a dapper suit. "Most people of course, would say it was a dream. But it was no dream. I had been seriously ill; and between sleeping and waking, all the moments of my life were caught up behind closed eyes and compressed into the one entity...myself; from conception to the woman lying with head on pillow, who had struggled so hard and succeeded, to live." A woman hovers in a dream-like state between life and death battling to survive she remembers the painful passing of her beloved grandfather where she learns a valuable lesson. "As a child she was the wildest and darkest of the Le Gallienne family; a black eyed dancing creature with a temper as quick and fleeting as her slim brown legs, and a will of her own which defied authority and restraint." Marie-Lys was the wilsest and darkest of the La Gallienne family, Grandma Borlaze says she is unatural but can she ever be tamed? "I saw Kate rushing, almost running, down the road to Pendilon station. I was surpirsed; I hadn't seen her for years...it must have been quite five,...since the day she took off with some boyfriend or other only six months after her marriage to Robin Clee."